Baking in 2012 did not get off to a great start. I had a bbq to attend on a 40 degree day and decided to make a simple tea cake. Except, that simple tea cake just would not bind, and then when finally cooked through, promptly fell apart when turned out of the tin. I contemplated serving Fail Cake for dessert, but decided to not work against the weather and to search for a recipe that involved no baking. 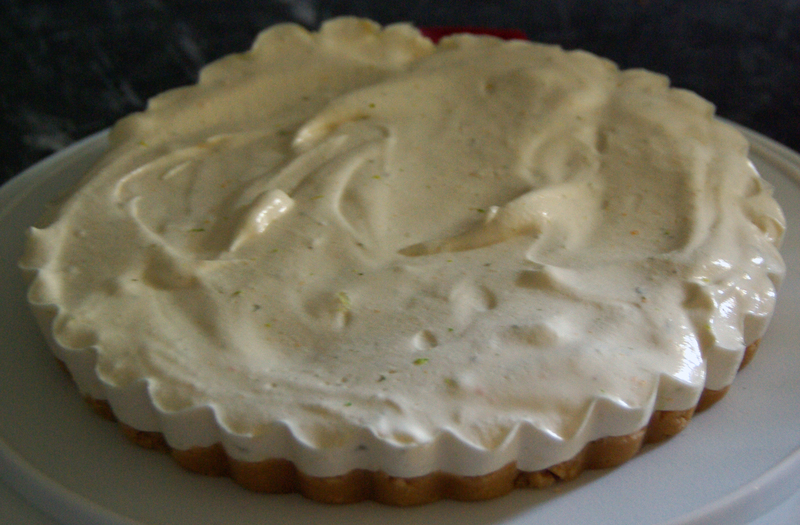 I came across this Lime Chiffon Pie on Off the Spork’s blog and could not resist. The end result was a really light, airy and delicious pie. I ended up using gluten free sweet biscuits too, so for those allergy sufferers: this is easily gluten and dairy free! I’m not the biggest citrus fan so in the future I may modify this to be a berry version! Grease a deep 23cm pie dish or springform pan. In a food processor, process the biscuits until they are fine crumbs. Add the melted butter and process to combine. Press the biscuit mixture firmly into the base and side of your greased dish/pie. Refrigerate for 30 minutes. Place the egg yolks, sugar, gelatine, rind, juice and the water into a heatproof bowl set over a saucepan of simmering water. Whisk until the mixture thickens slightly. Remove from the heat and pour into a large bowl. Directly cover the surface of the custard with a piece of plastic wrap to stop a skin forming on top of it. Leave to cool. Beat the egg whites with an electric mixer until soft peaks form. Gradually add the extra sugar, beating until the sugar dissolves. In two batches, fold the meringue into the custard mixture. Spread the filling into the crumb crust. Refrigerate for 3 hours.